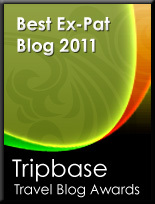 A very warm welcome to the ExpatCapeTown Newsletter in May 2010. Winter in Cape Town. Winter days can be really warm like we experience it currently when we can enjoy the great outdoors, but the Cape winter usually is wet and windy too. Rainy days however make for comfy outings to some of Cape Town’s great restaurants, the local museums or a day at the movies or theatre. In May, winter days here mean temperatures of around 14 degC at midday. And if you are lucky it might only rain intermittently and the sun is out most of the day still. Just get waterproof shoes and dress as there can be countless puddles. As Cape Town is preparing for the World Cup you will still find lots of construction in and around the city, but the city looks more stunning than ever. Everything is being cleaned up, most people are cheerful and excited and there is a special vibe in the air too, especially on "Vuvuzela Fridays", when all soccer fans dress up with Bafana Bafana colours. Many of my readers think about moving to Cape Town with their families and as the school year in the Northern Hemisphere now comes to an end soon, you want to know more about living in Cape Town with children. Especially now that the beauty of the city and the country is screened in the media overseas, it shows that Cape Town is a great place to live in and is becoming more and more popular now than ever with expatriates around the world. So what is important to know if you want to come to the Mother City with your children? Let me show you! Visiting foreign countries not to mention moving to foreign shores is quite a daunting task for many parents. Children are naturally curious to new environments, but often they are reluctant to leave family and friends behind and meet new people. Then you might have heard about Cape Town’s Crime statistics and will worry about your families’ safety. Here are some activities and tips how to make your travel or move to the Mother City a successful one and how to get your kids interested into their new surroundings and how to help them to adjust. • Get your kids interested in the country: Read some easy facts for kids about the Mother City. • Pack the most favorite toy and bring it with you to keep your kid company when they feel insecure or tired. • Go out and meet the locals at local playgrounds, play centers and nurseries. Cape Town’s suburbs offer lots of childrens’ facilities. • Keep your kids active with walks on the beaches or even getting them surf lessons. • Enjoy the various outdoor activities with your kids or enjoy the museums or kids shows on a rainy day. • Prepare your move well and collect with them as many facts about Cape Town as possible. Learn as much as you can about your new environment. And teach your children at least some basic words in Afrikaans and English. • Watch some films about South Africa together, either on You Tube or get some videos about Cape Town at Amazon. The wildlife your kids will be able to see here on safaris is always a big draw card, especially for the younger ones. Teens will love to know that water sports like Surfing, Kite boarding and Sailing are popular with the South African youths and Cricket, Soccer and Ballet are very popular with the kids here too. If they are interested in these sports it will be easy to make new friends when they join the respective clubs. • Check out the schools in your favorite housing area before you move, contact the schools and get some information also about extramural activities your children would enjoy to do or want to continue to practice. I would also advise to get study permits before your move. • Find the right housing area for your family, close to school and close to work is best as the traffic in the Mother City can cause quite a headache sometimes. • Pack a separate box with your child’s favorite toys and clothes, label it properly and possibly send it separately, so your child will not miss his/her favorite things during the first months of settling in, when maybe your container has not been arrived or fully unpacked yet. Enjoy the energetic sounds of the marimba drums? Then head to the Baxter Theatre on the 21 and 22 of May 2010. This community outreach project is presenting various school bands and gives the music students of various excellent Cape Town schools the opportunity to show their musical talents. Your support of the annual Cape Town Marimba and Big Band Festival goes a long way too, as it will raise funds for the music departments of various schools and colleges. What else is on in Cape Town in May? More great events and shows in May 2010. Why Century City? Its location outside of the Cape Town City Center, but still very well connected to the business center of the Mother City via the N1 Highway is one big plus. Being one of the major business hubs outside the CBD as well, the Century City area is still being developed and growing rapidly. The central Canal Walk shopping Center with all its facilities makes for comfortable and safe living and you never will have to go far to find amenities for your lifestyle. Health club, medical center, five luxury hotels, major shopping facilities, fine dining and entertainment are abundant in this suburb and therefore many expats from around the world choose this area as their new or temporary home. Where to stay? There are smaller houses and modern apartment complexes of all sizes build mainly around the Century Lakes. All the complexes come with park-like setting and communal pools. 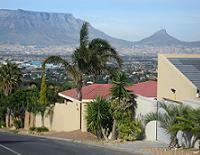 From most of the south west facing residences you will also have splendid views towards Table Mountain. Where to go? There are plenty of entertaining facilities at the Canal Walk shopping center. For great cakes and lunches try the lovely Limnos Bakery, who offer delicious sweet cakes and some very tasty delicatessen on their menu. If you fancy rollercoaster and toboggan rides, then head to Ratanga Junction which is open during the school holidays. Where to do your grocery shopping in Century City? At Canal Walk shopping Centre you will find Checkers and Pick&Pay Supermarkets as well as a huge Woolworths Store. There are also a few health stores located in the Shopping Center. What is a“naartjie” Pronounced "naa-tshee", this is the name of the popular oranges you will be able to buy at many fruit and veggie stands in big packs or at the local supermarkets now. What is a vuvuzela? The vuvuzela is something you will hear more and more now. The sound or noise of the "instrument" of the worldcup 2010 will blow off your ears at the stadium if you sit right next to an ardent fan who likes to blow it constantly. So be prepared to take some earplugs if you visit any soccer matches here. The noise can be deafening at 120db or more! Where to find a delicious patisserie and cafe? Silver Spoon in Cobble Walk Centre, new and already popular. The in-house chef bakes the most delicious almond croissants you can get outside of France. And the other little French pastries und cakes and tarts are a feast for the eyes. The setting is not really that special as it is located in the courtyard of a however friendly modern shopping centre, but the food on offer promises a real treat. Where to find a German playgroup and kindergarten in Cape Town? There are several kindergartens for the German speaking community in the Mother City: St. Martini has got two kindergarten facilities, one in Long Street and one in Wynberg. Then there is Bellville Kindergarten and a playgroup in Somerset West and finally there will be a new kindergarten in Blouberg which is called Kunterbuntkidz, from the end of May. Where to buy organic nut butter? Check out the health food section at dischem and wellness warehouse as well as the smaller health food stores in the major shopping centers. Then there are many smaller health food stores like Nature’s Deli in Table View or Health Connection all over Cape Town which are worth a try. A big range of different nut butters is usually available at Organic Living in Constantia Village where the staff is very helpful to source for your requirements too.